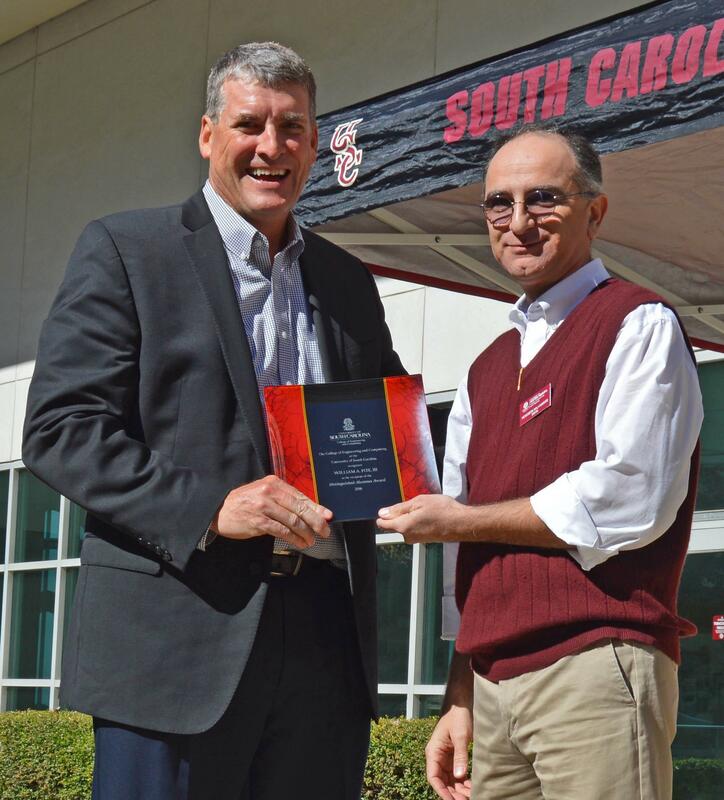 Columbia, SC – The University of South Carolina’s College of Engineering and Computing (CEC) recently honored two distinguished alumni for their professional accomplishments and service to the College. 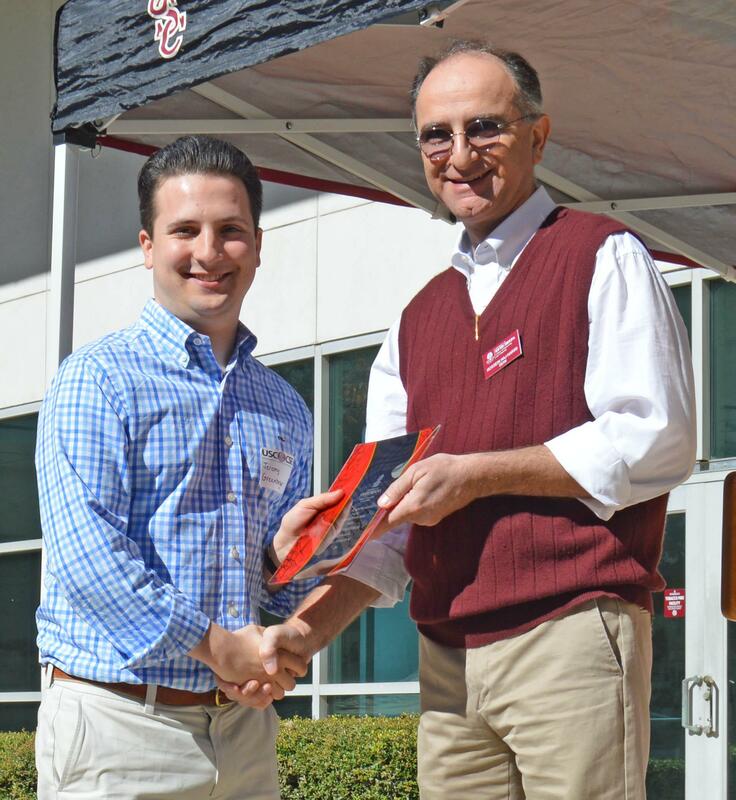 On Saturday, November 5, the CEC named William “Bill” Fox as 2016 recipient of the Distinguished Alumnus Award, and Jeremy Greenberger accepted the 2016 honor for the Young Alumnus Award. The Distinguished Alumnus Award recognizes an individual who has made notable contributions to his or her profession, community and university. William A. “Bill” Fox, class of 1978, graduated with a degree in civil engineering. Fox is the President of the Nuclear Energy and Technical Services responsible for the Federal and Commercial Services business portfolio for BWXT. He spent most of his career in the nuclear energy industry, starting as a structural engineer with Duke Power working on the design and construction of 7 nuclear units. He has focused his career on managing engineering, procurement and construction activities of major, complex projects, most notably being the overall SVP/Project Director for the VC Summer new nuclear project in SC from 2008-2013. Over his 38-year career, he worked his way up through the supervisory and management ranks to holding executive positions at Duke Energy, AREVA, Shaw Group and BWX Technologies, where he is currently employed. His community and professional involvement has extended to serving on the Engineering board of UNC Charlotte from 1988 to 1996 where he also was a part-time professor for two semesters. He held various officer positions in the (ASCE) American Society of Civil Engineers local, state and national levels in his mid-career and is currently a Member of ASCE and the American Nuclear Society (ANS). He has also been serving on the USC Engineering Advisory Board for several years and is currently Chair. He has also been active in many civic, philanthropic and religious activities serving on Boards, fund raising campaigns, and engaging personally with his involvement. Fox currently serves on the Board of Directors for the Los Alamos and Livermore National Labs and Nuclear Fuel Services. He is a registered Professional Engineer in 4 states including SC, NC, FL and WI. Fox is married to wife, Debbie of 35 years. They have four children (one a USC alumnus as well) and one grand-child. The Young Alumni Award recognizes an individual who graduated within the last decade and who shows the potential to make a positive impact professionally and serve as an example for other recent graduates. Jeremy Greenberger is a 2014 graduate with a bachelor’s degree in Computer Science. He is a software engineer at IBM and making his mark as a prodigious ideas man. He has submitted over 100 invention ideas for internal IBM review, of which 18 have so far been approved for patent applications and six have been submitted to the US Patent and Trademark Office. Jeremy was fascinated with both technology and business starting as a teenager growing up in northern New Jersey. He and his father, a dentist, started their own company on the side when he was 16—a digital advertising business. He hadn’t decided for sure that what he really wanted to do was be an inventor until he arrived at IBM’s offices in Durham, North Carolina, and started working on mobile and cloud technologies. Jeremy’s goal is to become the youngest-ever IBM Master Inventor. At 24, he has a little over a year in which to make it.